Orton Joseph Bjerkager( Birchfield), 91, Lisbon, ND, peacefully passed away Saturday, August 24, 2013 at the North Dakota Veterans Home, Lisbon, ND. A Memorial Service will be held Thursday, 5 PM at Willow Creek Chapel, Wahpeton. Visitation with the family will be one hour before the service. Vertin-Munson Funeral Home, Wahpeton, ND, is in charge of arrangements. He was born September 13, 1921 to Olaf and Myrtle (Gylland) Bjerkager in Colfax Village, ND. He grew up in Colfax and Galchutt, ND and was baptized and confirmed at the Betania Lutheran Church (Bethany Free Lutheran Church), Galchutt, ND. 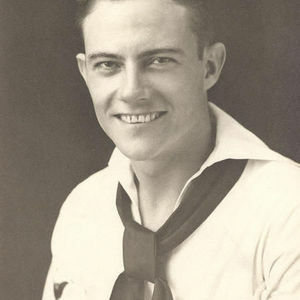 He graduated high school from Wahpeton, ND and enlisted in the Navy on October 30, 1940 prior to graduation. Prior to becoming a submarine sailor he did three lend-lease convoys in the Atlantic and then nine war patrols in the Pacific on the USS Pollack. He received a Commendation for saving the USS Pollack and its crew during its eighth war patrol. After separation from active duty on December 27, 1946 he enlisted in the Naval Reserve, retiring in 1979. Orton married Grace Elizabeth Rothwell on March 5, 1945; afterwards moving to Nashville, TN where he attended diesel college on the GI bill; afterwards moving to Waukesau, WI to work for Waukesau Motors . In early 1956 Orton petitioned the court to change his last name from Bjerkager to Birchfield as he was a salesman and customers couldn't pronounce his last name. His work moved them to Pewaukee, WI, then Golden Valley, MN; River Falls, WI; Detroit, MI; and back to St. Paul, MN. In 1979 they moved to Escondido, CA where they were long- time residents at Lawrence Welk Village. He was a member of the American Legion and Submarine Veterans. He moved back to North Dakota in 2006 to be close to family and spent his last year as a resident of the ND Veteran's Home in Lisbon, ND. Orton is survived by his son Scott (Susan) Colfax, ND, grandchildren James Randall (Fargo) and Angela Grace (Ames, IA), sister Ardyce Jacobson Moorhead, MN, numerous cousins, nieces & nephews. He was preceded in death by his parents and his wife of 49 years. In lieu of flowers, memorials may be given to North Dakota Veterans Home, Lisbon, ND or Wounded Warriors Fund. The beautiful and interactive Eternal Tribute tells Orton's life story the way it deserves to be told in words, pictures and video. Scott and Sue, our thoughts are with you during this time. Wonderful remembrance of your Dad. Wow....what a wonderful and historical obituary of OJ. I will always remember his contagious smile. Rest in peace with your comrades OJ and your lovely wife Grace.